The Sigma F80 Flat Top Kabuki Brush is one that everyone talks about. It's all over YouTube, reviewed everywhere and loved by all. In February (see my haul) I purchased two brushes from the Sigmax line from Sigma. These brushes are created with Sigmax fibers and are designed to apply powder, cream and liquid products without absorbing most of the product in the bristles. Deciding which brush I wanted to buy from the collection was difficult as there's five. Although they're all very much the same, their shapes are very different and they all work well for different people and purposes. In the end I decided on the F80 purely because it seemed the safest. For me, this brush was love at first use. Using this brush made foundation application so effortless and flawless, especially after using my hands for so long (previously I'd never found a brush I liked). The Sigma F80 Flat Top Kabuki Brush seamlessly blends foundation into the skin, making it look natural, whilst evenly distributing product for exceptional coverage. The bristles on this brush are very dense, however they're also very soft, meaning that they easy apply products to all the 'nooks and crannies' of our face. I only use this brush to apply liquid foundation, although I've heard it also works well with cream and powder products. To see my old foundation routine using the Sigma F80 Flat Top Kabuki brush, scroll down for a video. Previously I would dot the foundation onto my face and distribute it with the brush, using sweeping and dotting motions. In the last week, however, I've changed the way I apply my foundation. Instead of dotting the product onto my face, I now put a pump onto the back of my hand and dip the brush in that, dot it all over my face and distribute as above. Although the finish is very much the same (in fact, I think it's better), I've found I use a lot less product and the result looks a little more natural. Cleaning my Sigma F80 Flat Top Kabuki is no tough job. I clean this brush as I do all my others; with some water, hair shampoo and a big mess! Using it almost everyday means I have to wash it frequently but that's to be expected. I find by approximately the fourth day of use I'm noticing a decline in application quality and am washing it that night. As I'm sure you can tell, I'm a big fan of this brush and I recommend it to everyone. The Sigma F80 Flat Top Kabuki Brush sells for $16.00 and is a fantastic investment (so much so that I'm thinking of buying a second one). It can also be purchased in a set of four Sigmax Kabuki brushes for $56.00 or a set of Five Sigmax Kabuki brushes for $69.00. 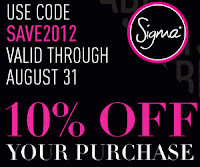 For the month of August, Sigma is offering 10% off their brushes. How? Use the code SAVE2012 at the checkout. Have you tried this brush? What did you think? What's your favourite way to apply foundation? ** I am a Sigma Affiliate, however all opinions are my own. I purchased this brush. This brush is awesome. Highly recommend it too. Infact the 3 in that line are all fabulous brushes.